Most everything they say about us gets said in Italian. You get the general idea, we think. What can you do with an immense historical tobacco factory, Manifattura Tabacchi, built in 1854? 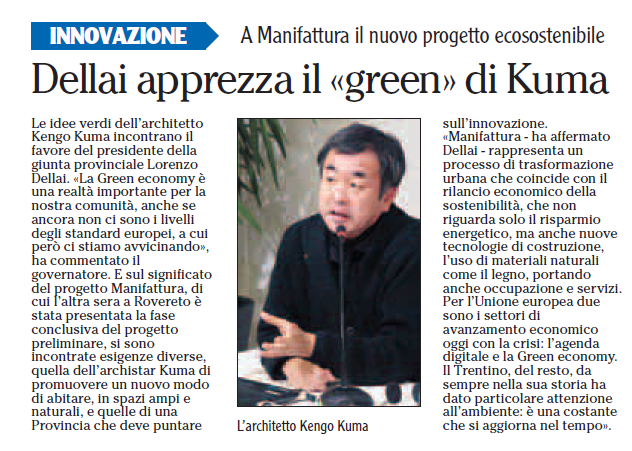 In Rovereto, Italy, they had already made up their mind since the beginning in 2008 when they created Progetto Manifattura, a business incubator for new enterprises specialized in the green economy sector. 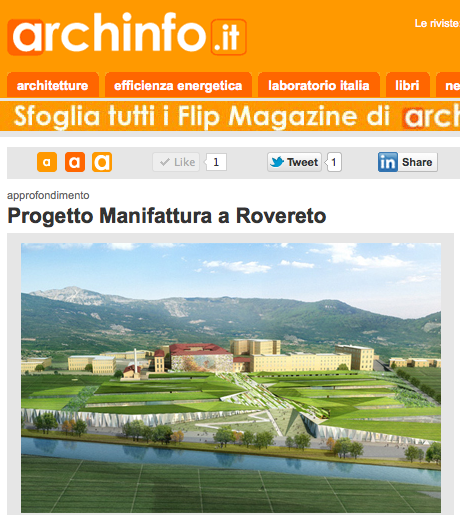 The article describing Progetto Manifattura was published on wired.it. 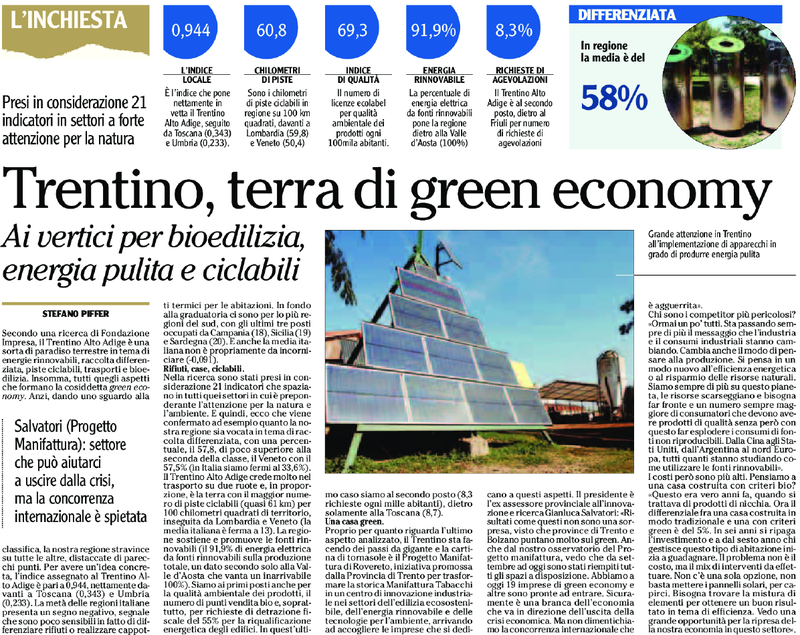 Read a translation of the article on the Invest in Trentino site. The provincial authority of Trento had always been trying to transform Rovereto in a industrial and cultural hub for clean tech. An hypothetical mirage? Not really. On nov 21 the project celebrated the inauguration of a new space called "Innovation Factory”: 4,000 square meters that doubled the existing offices and spaces for new enterprises. 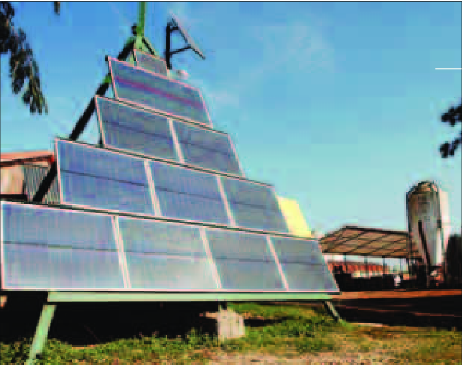 twice the space for green start-ups. The new space houses 17 start-up companies involved in the renewable energy, sustainable building and environmental services sector. They have found their location in this building, the Manifattura Tabacchi, recently renewed and aimed to become a LEED certified green building. 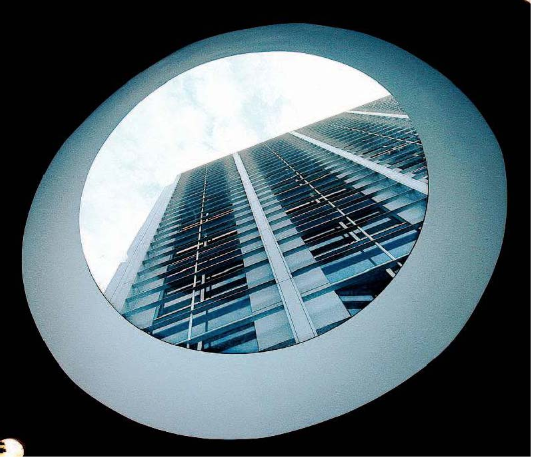 Each start-up has its office, three walls and a large window, to preserve privacy and a the same time be connected – visually but not only – with the other enterprise. «Here we have created an unprecedented network, because we put together startup companies that have unique expertise in multiple sector from green builtin to renewable energies», explain Michele Tosi, operation manager di Progetto Manifattura. 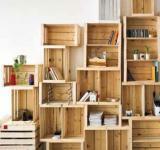 Network is a keyword at Progetto Manifattura, a mission for whom has ideated this project. For this reason they have created network-event as the "Pizza Condominiale", a convivial potluck where all the startups meet and mingle,i n order to discuss new business-ops, ideas, projects, or to listen and chat with invited guest from across the green-biz world spectrum. Oros and Evotre are the first two enterprises that have been participating in the business incubator. 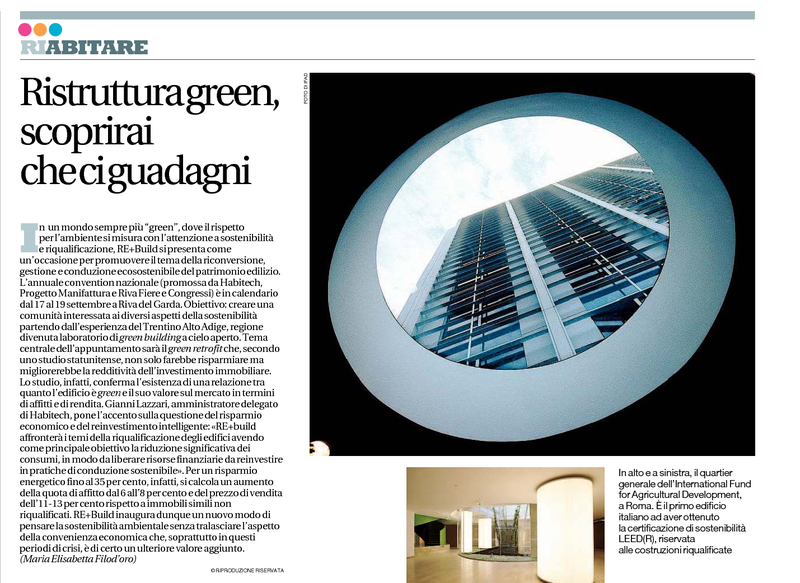 The first one deals with technical closures and green high-tech windows for buildings, while the second one provides “green-oriented” advices to the players of the design and construction industry. As Carlotta Cocco of Evo3 underlines, the opportunity of work side-by-side with others operators of the sector is one of the most relevant perspective: «The professional network we can develop here is our capital. Freelance professionals tend to work as isolated individuals, but networking is much more useful, especially in an industry such as the sustainability one that concerns the common goods of all». Alessandro Pezzani of Oros adds: «Having different working skills next to us was been very useful for the launch of our enterprise. For example, we needed a website, so we contacted GreenTrenDesign, the startup in front of our office». Progetto Manifattura requires the young enterprises to stay in the Innovation Factory at least six years and then take off as established companies. To access to the Innovation Factory a start-up needs to complete a pre-incubation process to test its business model and shape the identity and the mission of the start-up company. This phase take place in the Green House, “la Serra”, in Italian. The GreenHouse has been inaugurated in august 2011. «The young entrepreneur attend a “job interview” where he/she or they propose the start-up idea. If it appear to be feasible and interesting we welcome them in our yearlong program, that include two educational cycles: the basic, about management and the advanced one, that includes public speaking and marketing», explain Gianluca Salvatori, president of Progetto Manifattura and ex-counselor for Innovation for the Provincia di Trento. In the Greenhouse each startup has its own space. Prices are competitive: 30 o 60 € a month (45-90 $) for a coworking desk or a private box. Right now 22 companies are housed in the GreenHouse: median age is 32, 80% has a degree or higher education, almost 60% are women. «We don’t provide funds, it is our policy. We believe that is utmost important to provide for services and support, rather that give cash that will be spent in expensive consultancy. Here they can have all they need, plus visibility, exposure and networking», continues Salvatori. Progetto Manifattura does not end here. Next year construction of a new section – the Green innovation Factory – will begin- 60,000 square meters of wooden structure for new offices, R&D, manufacture areas, staging section. The building will have a green roof, that will be used as public park, a gym, a food court and shops. 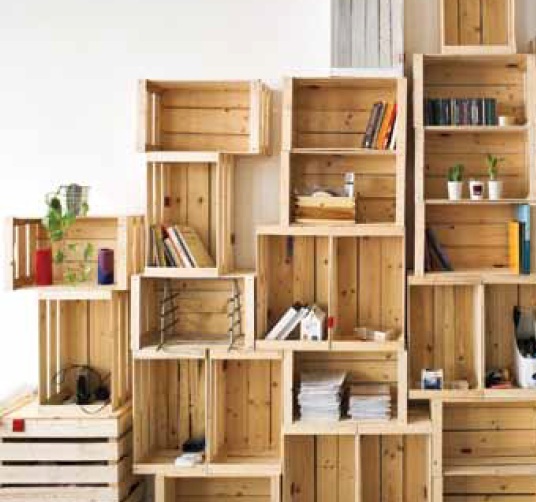 For Tosi «the idea is to open-up Manifattura to the public and share these spaces with the citizens of Rovereto a location that once – as tobacco factory – was inaccessible and unknown». The last question is: how can this paradise of green start-up is financed? public money, brought by the virtuous province. 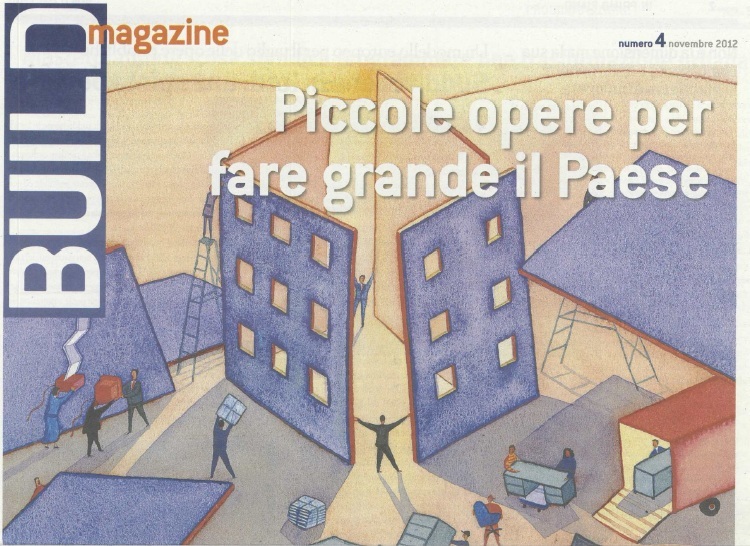 «The Green Innovation Factory employs state funds, while maintenance and services are paid by Provincia Autonoma di Trento, owner of the building and by tenants dues», explain mr. Salvatori. None will stop this force of nature…sorry business. Terra di confine, di passaggio e passaggi. Quasi fosse una vedetta, il Trentino si guarda attorno. 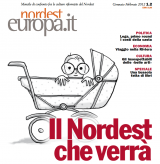 Prima a nord, poi a sud. Questo fazzoletto di terra, 530.000 abitanti appena, ha scelto la via dell’innovazione. Un percorso, culturale e istituzionale, nato cinquant’anni fa. Quando nel 1962 Bruno Kessler fonda l’Istituto Trentino di Cultura, trampolino di lancio dell’università di Trento. Un distretto innovativo dedicato alla sostenibilità al posto dell'ex Manifattura Tabacchi. Un polo della ricerca voluto dalla Provincia di Trento per fare dell'icona della storia industriale del trentino un "green innovation hub" con la collaborazione di professionisti, aziende e imprese del settore. (...) Progettazione urbanistica e architettonica ma anche analisi economica e aziendale stanno alla base del processo di rigenerazione dei 9 ettari di area, in parte da riconvertire, in parte da demolire e ricostruire. 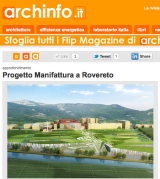 Il progetto di Rovereto è in itinere ed è un'iniziativa modello in termini di progettazione e programmazione urbana, ma anche un laboratorio attento alle ricadute sociali e all'economia del territorio. Secondo una ricerca di Fondazione Impresa, il Trentino Alto Adige è una sorta di paradiso terrestre in tema di energie rinnovabili, raccolta differenziata, piste ciclabili, trasporti e bioedilizia. 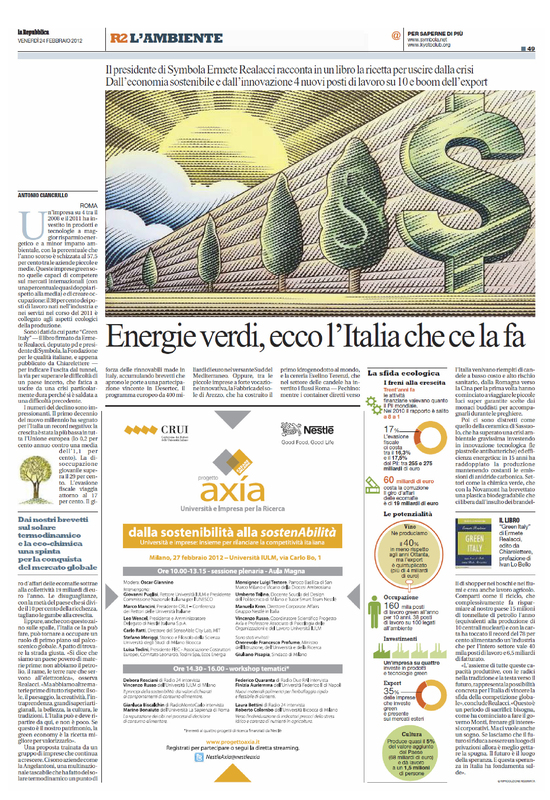 Insomma, tutti quegli aspetti che formano la cosiddetta green economy. L'articolo parla del convegno REbuild e i risparmi possibili con la riqualificazione edile. Progetto Manifattura - Green Innovation Factory è un'iniziativa promossa dalla Provincia autonoma di Trento per trasformare la storica Manifattura Tabacchi di Rovereto in un centro di innovazione industriale nei settori dell'edilizia ecosostenibile e dell'energia rinnovabile. 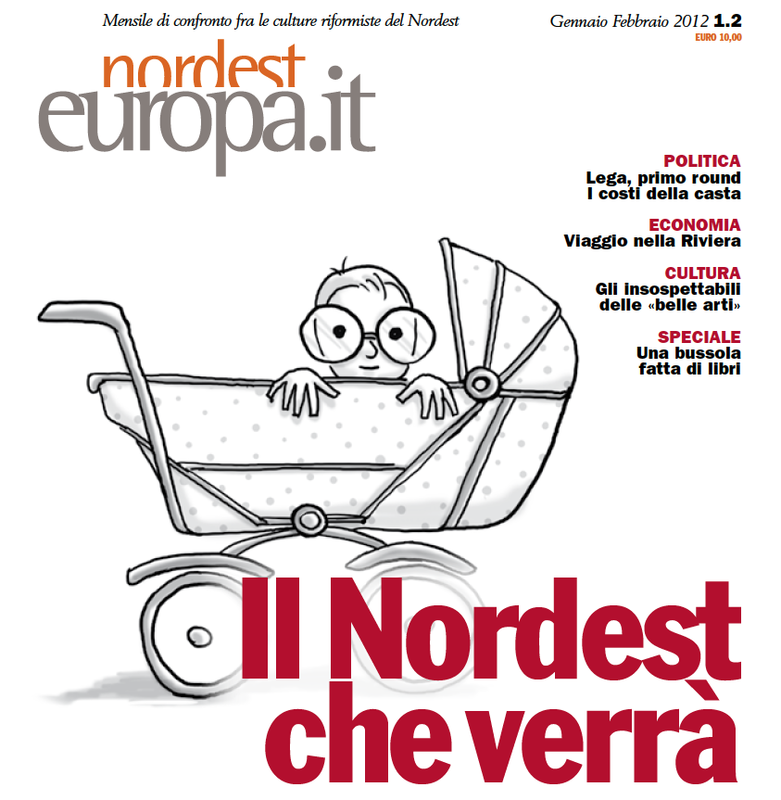 The magazine Nordest europa.it (in italian), Jan-Feb 2012, talks about the economici future of Italy beyond the present crisis. They see entrepreneurs dedicated to emerging markets like ecosustainable products and services, ICT and other high tech areas.